Volunteers can assist in a variety of ways. During the interview, staff will determine your interests and find opportunities that are mutually beneficial to the volunteer and Ochsner. Volunteer positions include patient care, service, and clerical duties, as well as other special projects. Volunteers in service areas greet patients, family members, and visitors and assist them in locating their destination, escorting by wheelchair, delivering mail and magazine, etc. 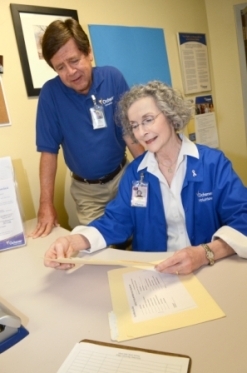 Volunteers in clerical areas assist the Ochsner staff with basic clerical duties, such as answering phones, creating packets, data entry, filing, etc. For more information on these and many other opportunities, please call 504-842-5085.